These are photos of the painting " A Tribute to the People of Malta " by David Aldus that sold for £10,000. 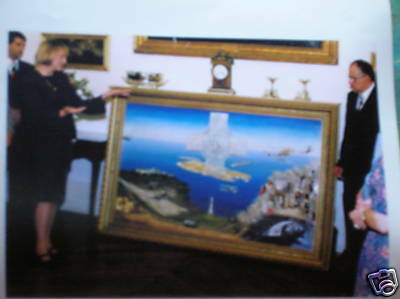 The President of Malta, pictured, gave the Painting to the Museum of Malta in Valletta. Other Aldus accolades include full membership election in 1994 to UA United Artists. In that year he was awarded the Acrylic Painting prize at Westminster Central Hall, London. In 1995 Aldus won the Oil paintings prize at UA annual exhibition. In 1995 he had work displayed at the Royal Institute of Oils in their annual exhibition held at the Mall Galleries, London. He also had work displayed at the Royal Society of Marine artists at their annual exhibition. In November the Royal Society of Marine Artists asked him to display his work at Lambeth Palace where again he sold all his paintings. 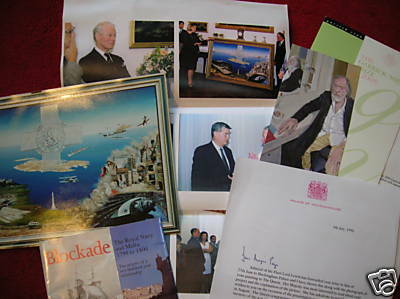 The montage in the slideshow above showing the letter from Holyrood House from H.M Queen Elizabeth II complimenting David Aldus on his painting, having been presented to the President of Malta.Dr Ugo Mifsud Bonnici.